Fresh cut Curly willow is harvested for your custom order and available in either short or long lengths. Choose Curly Willow tips for branch lengths of 28-40 inches, and our standard Curly Willow branches which measure 40-52 inches in length. Either product is shipped direct to you from the farm for unparalled freshness. As a flower wholesaler, Whole Blossoms offers free shipping on its wholesale Curly Willow branches with your online order. Buy in bulk and save! Flowers are one of the most popular elements in wedding décor. They are MotherNature’s most loved creations, but they are hardly her only creations. Another lovely natural decoration element is thecurving willow branch. They will surprise you when you use them in bouquets, art and craft, and décor. These delicate branches can be clipped to any size you need. They are wonderful items that suit minimalist and modern themes. They provide a soothing and even chic feeling to their surroundings. They are very expressive. Even two curly willow branches can give flower arrangements a lovely, graceful look. The curly willow is a widely found tree in China. It is scientifically known as Salix matsudana. This tree is deciduous and can grow to 40 ft in height.The branches are naturally curving which give it a distinct shape. This is why the tree is also known by the names "tortured willow" and "corkscrew willow." When the tree grows with age, the branches become thicker and gnarled. Sofor decoration purposes, the younger and freshly cut branches are used.Willow branches used for decoration canbe anywhere from 30 to 70 inches long. Curly willowsare now found all across Europe, North America, and Australia. The color of the branches is green when young and fresh. They become golden and dark red with time, and that gives off a special charm. These branches can be used in a cluster. Branches of different heights in tall vases will give off lovely autumn, wintry feeling. As the branches dry, they will look intriguing and charming. These branches are perfect for décor in a contemporary and modern setting. They create an artsy look when set against soft and pale colors. Placing glittery and warm lights on willow branches can create a breath-takingatmosphere! You can decorate them in several ways. Bunches of curly willow can be used in a rustic theme as well, with flowers and berries. 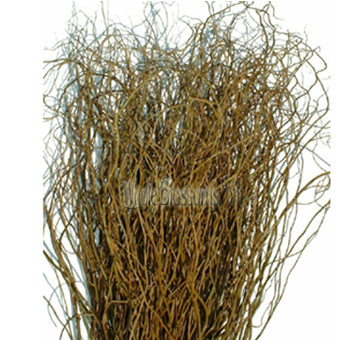 Since curly willow branches can be very flexible, they are ideal for art and craft. They can be woven atop baskets and jars, around candles and other small gifts. You can even use them in wreaths with artificial or real flowers.They are pliable when they are young. Curly willow tips are a perfect element with which you can express your creativity. Make sure that you get the freshest ones if you want to experiment with these branches. They are also very useful in home décor. If your home has wooden paneling and furniture, then curly willow branches are the perfect addition! Place a few golden curls in a vase on wooden shelves or next to a fireplace. They suit bothbrick walls and light-colored walls. If your home has a contemporary look, then the branches in a tall vase will add to that theme. One of the most popular uses for willow branches is in weddings and flower arrangements. This is because of its graceful, thin curves. Its bare, dark look is pleasing to the eye.Curly willowfloral arrangements are tasteful and dignified. They are used to create pretty wedding arches. When woven with bountiful flowers, they make a spectacular sight. They can complement lush white flowers. The branches are perfect for those wanting an elegant theme for their celebration. They make softly colored flowers look even more beautiful. But they work amazingly well with dark colors too. Deep purple, blue and dark pink flowers are complemented by willow branches.Curly willow branches used in a colorful bouquet of flowers will transform its look completely. It has the capacity to turn a brightly-colored bouquet into a painting. You will see this effect if you pair willow branches with spring blooms like daffodils. A few branches of curving willow with a few dahlias, roses or hydrangeas will look beautiful and attractive. Curving willow branches need some careful handling. The dark red, old branches are great for showpieces, but they can become brittle. For art and decoration purposes they need to be as young and fresh as possible. To buy golden curls willow wholesale, you should try Whole Blossoms. Their willow branches are delivered straight from the farms to your doorstep. They offer 24/7 fresh delivery of flowers and greenery at great prices. They are very experienced florists and cater to a wide range of customers. So even if you don't have a huge wedding to host, why not try these willow branches? They can spruce up the look of your cozy homes and will surely impress your guests. Decorations need not always be restricted to flowers and showpieces. If you broaden your horizons, even delicate branches can do the trick!